Ice fishing, angling through a hole in the ice, is a Finnish speciality offering unforgettable experiences. Angling for a pike and perch is common throughout the country, but whitefish and burbot are also popular catches. Did you know that the dark evenings of January and February are the best time to catch burbot? Perch can be caught through a hole in the ice in winter as long as the waters are covered with thick ice. Perch occurs in waters throughout the country and bites keenly. Roach and similar fish are also the normal catches of ice fishers. Choose the fishing location that suits you best, because obtaining permits to fish in Finnish waters couldn't be simpler. With a few exceptions, no permit is required for basic angling with a hook and line - in summer or in winter in the form of ice fishing. In other words, angling and ice fishing may be enjoyed completely free of charge. Two documents are required when fishing by means other than basic angling or ice-fishing. The first is a receipt for payment of the fishing management fee, the second the actual fishing permit. The fishing management fee for the calendar year 2006 is €20 or €6 for seven days' fishing. The fee must be paid before you start fishing. It can be paid using a self-service payment machine, through your home computer, or with an ordinary giro payment form available from banks, to the state giro account Nordea 166030-101496. Payment is non-transferable. Keep the receipt with you when you go fishing. The seven day fishing period is counted from the day of payment or from another date entered separately on the payment receipt at the time of payment. Persons under 18 or over 65 need not pay this fee, nor do those who merely assist in the fishing and do not handle the fishing equipment during the actual fishing. Special fishing sites require permission from the owner of the water area. Such permits are sold by individual fishing districts, local fishery associations, municipalities, private owners or the National Forest and Park Service and are required for lure fishing, other types of fishing and crayfishing. This also applies to fishing competitions. Permits include specific information about the fishing methods allowed, fishing times and other pertinent rules and regulations. Please ask tour organisers for further information. Separate regulations apply in the Aland Islands, where the licence system above is not valid. 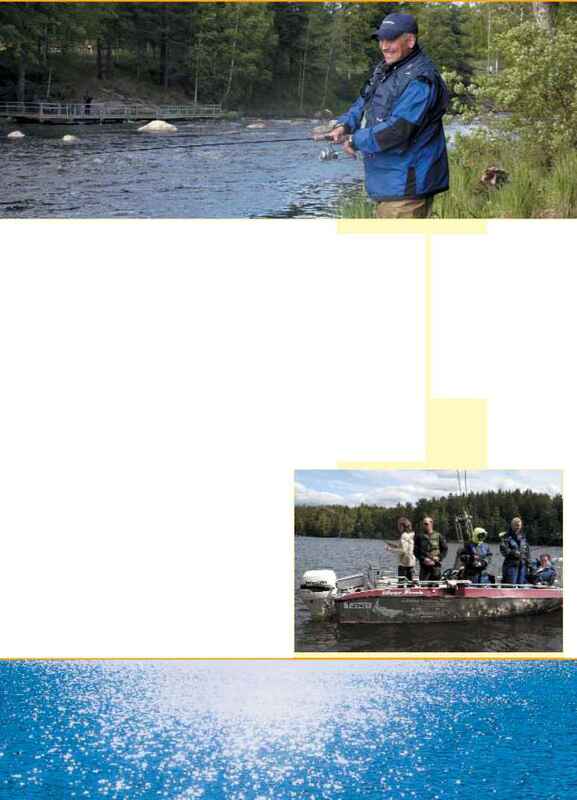 Discover the best fishing in Finland! Use our portal to find the best fishing waters, guides, equipment and accommodation. Begin your fishing vacation on the Internet with some great photos and site descriptions -come on in! 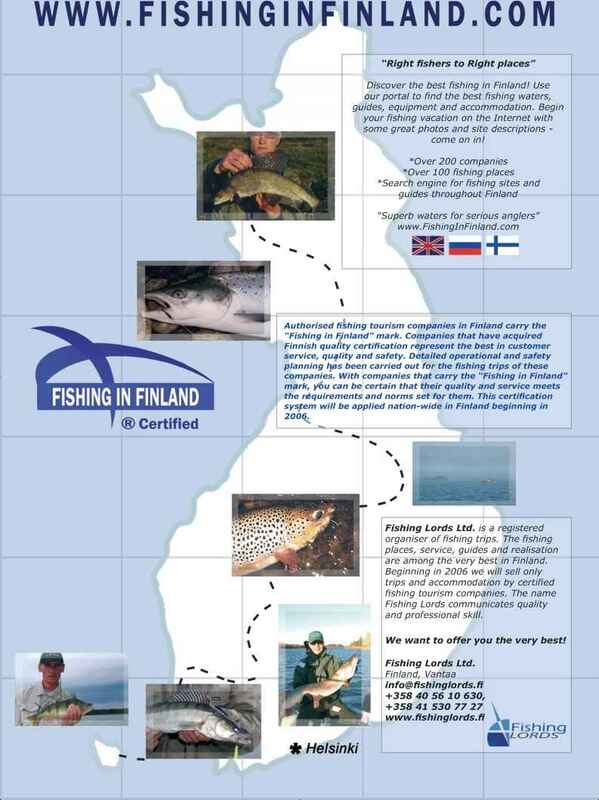 Authorised fishing tourism companies in Finland carry the "Fishing in Finland" mark. Companies that have acquired Finnish quanty certification represent the best in customer service, quality and safety. Detailed operational and safety planning tyas been carried out for the fishing trips of these companies. With companies that carry the "Fishing in Finland' mark, y6u can be certain that their quality and service meets the requirements and norms set for them. This certification sysfem will be applied nation-wide in Finland beginning in 2006. Fishing Lords Ltd. is a registered organiser of fishing trips. The fishing places, service, guides and realisation are among the very best in Finland. Beginning in 2006 we will sell only trips and accommodation by certified fishing tourism companies. The name Fishing Lords communicates quality and professional skill. We want to offer you the very best! The archipelago around Helsinki and along the coastline is unique in the world. In addition to a great city break vacation, the heart of Finland's capital also offers a paradise for anglers in search of pike, perch and pikeperch! The pristine nature and peaceful archipelago guarantee an unforgettable fishing experience. On these fishing trips you can admire majestic seabirds, fascinating geological reminders of the last Ice Age, and truly breathtaking seascapes. What's more, the live fish you catch can be transformed into a delicious meal by one of our expert chefs. Is it possible to fly fishing at winter finland?